Propolis has demonstrated a strong antioxidant activity1. This property, together with other compositional parameters2 could contribute to the difficult standardization of propolis. Antioxidant activity should be determined by methods based on different mechanisms, and against several free radicals3. The purpose of this research was to help characterize propolis from Aragón (Spain) by determining the oxygen radical absorbance capacity (ORAC)4, trolox equivalent antioxidant capacity (TEAC)5, 2,2-diphenyl-1-picrylhydrazyl (DPPH) assay6, as well as the radical-scavenging effect on hydroxyl radicals (AOA)5 on hydroalcoholic extracts of eight Aragonese propolis samples. Propolis extracts were obtained with 70% (V/V) ethanol. All extracts showed high antioxidant activities. The following averages were obtained: For ORAC 11070 µmol trolox/g, for TEAC 1040.7 µmol trolox/g, for IC50 DPPH 0.0698 mg/ml and for AOA 0.8783 mmol uric acid/g. At the 95.0% confidence level, significant linear correlations were found between ORAC and TEAC (r= 0.9436), ORAC and AOA (r= 0.9142) and TEAC and AOA (r= 0.9919) and a double reciprocal correlation between TEAC and DPPH (r= 0.7403). The lack of correlation between ORAC and AOA with DPPH results is likely due to the fact that the antioxidant compounds of Aragonese propolis could react very fast with both peroxyl (ORAC assay) and hydroxyl (AOA assay) radicals, and at a slow pace to DPPH due to steric inaccessibility3. Nevertheless, further studies are necessary to corroborate this conclusion. Acknowledgements: To all the beekeepers who have provided with a free sample of propolis for this study. 1. Daleprane JB, Abdalla DS (2013) Emerging Roles of Propolis: Antioxidant, Cardioprotective, and Antiantiogenic Actions. Evidence-Based Complementary and Alternative Medicine 2013: 1-8. 2. Bankova V. (2005) Chemical diversity of propolis and the problem of standardization. Journal of Ethnopharmacology 100: 114-117. 3. Prior RL, Wu X, Schaich K, (2005) Standardized Methods for the Determination of Antioxidant Capacity and Phenolics in Foods and Dietary Supplements. Journal of Agricultural and Food chemistry 53: 4290-4302. 4. Huang D, Ou B, Hampsch-Woodill M, Flanagan JA, Prior RL (2002) High-Throughput Assay of Oxygen Radical Absorbance Capacity (ORAC) Using a Multichannel Liquid Handling System Coupled with a Microplate Fluorescence Reader in 96-Well Format. Journal of Agricultural and Food chemistry 50: 4437–4444. 5. Osés SM, Pascual-Maté A, Fernández-Muiño MA, López-Díaz TM, Sancho MT (2016) Bioactive properties of honey with propolis. Food chemistry 196: 1215-1223. ISNAD SANCHO, M. Teresa , OSÉS, Sandra M. , RODRÍGUEZ-FERNÁNDEZ, Andrea , FERNÁNDEZ-MUIÑO, Miguel A. , PÉREZ-ARQUILLUÉ, Consuelo , LÁZARO, Regina , BAYARRI, Susana . "Antioxidant Activities of Propolis from Aragón (Spain)". 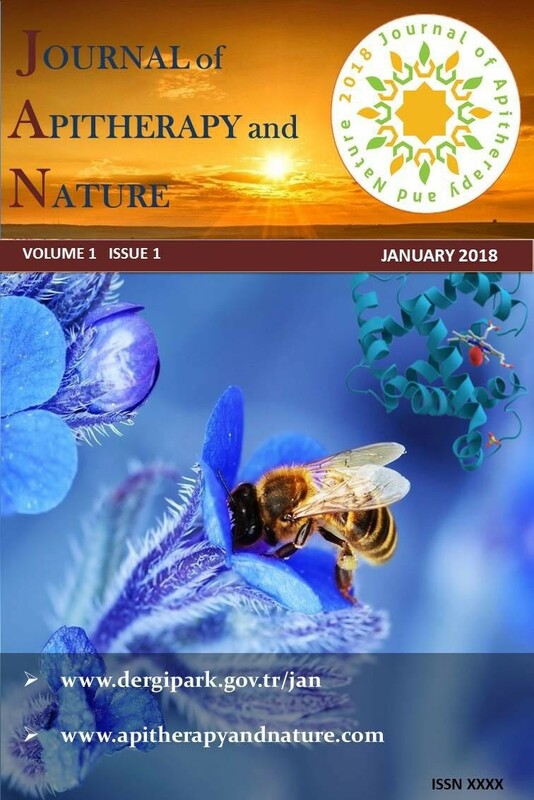 Journal of Apitherapy and Nature 1 / 3 (December 2018): 67-67.